Picking up where I last left off, after our long weekend working on the bathroom with my parents, I had a work trip to New York City for the rest of the week. While I was gone, Chip did a great job keeping the remodeling going. 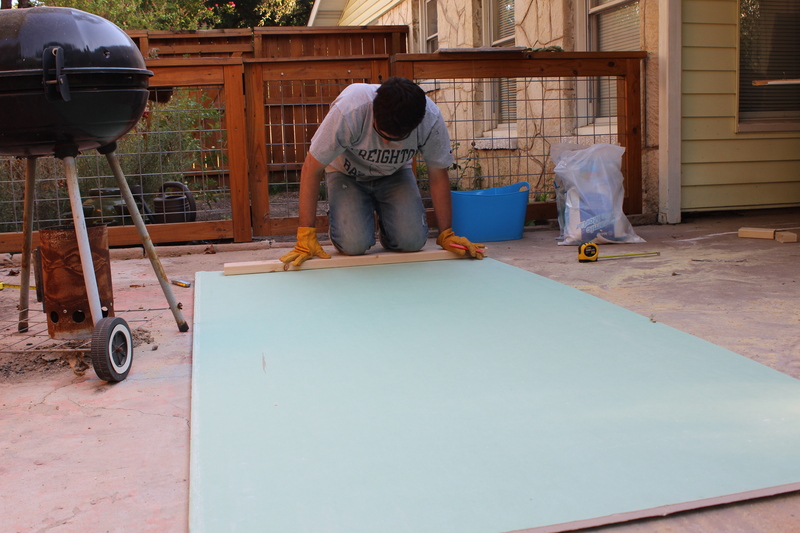 After finishing up the grouting and sealing, his next big task was working on the shower sliding door. Let’s just chalk this one up as another item we didn’t expect to be so incredibly complicated. From what I understand, while we did everything we could to make sure the tub was level when we installed it, it somehow didn’t settle 100% level. This meant that while the frame of the shower door went in fine over the ledge of our tub, we ran into trouble when trying to close the sliding doors. No matter how much Chip adjusted the wheels on the sliding doors and tried to add shims to the frame to see if it would help, when we would close the door we would be flush along the frame in the bottom corner, but have an inch or so gap at the top corner (or vice versa). It was so very frustrating and I feel so bad that Chip tried to tackle it alone while I was in NYC. By the time I got back home on Saturday, Chip was understandably not in the best mood over the shower door (I don’t think I would have lasted as long). So after trying to figure it out together and even going to Home Depot for a new set (which, by the way, the HD employee was so not helpful with this return, glad all of our other purchases were at Lowe’s), we decided to just temporarily get a shower curtain so we could actually use the shower for the time being. 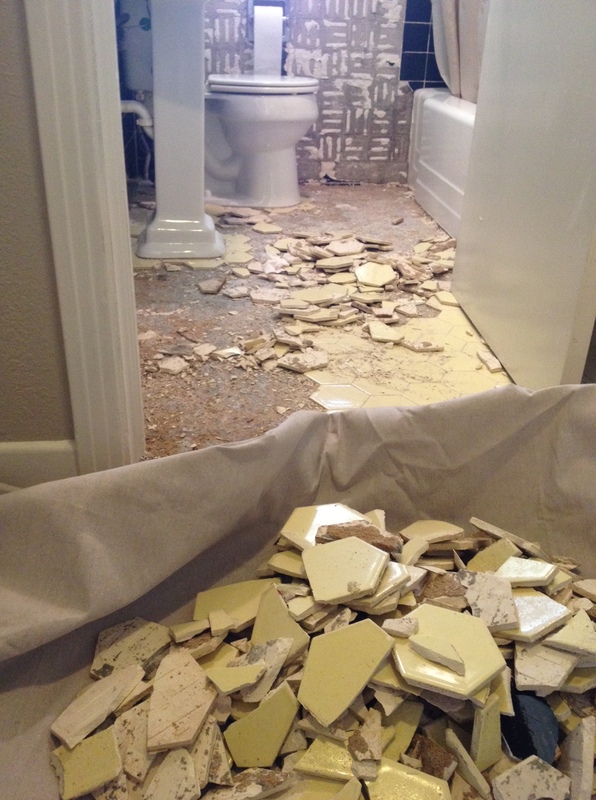 Now, it drove my parents crazy that we didn’t finish the bathroom while they were in town the previous weekend. 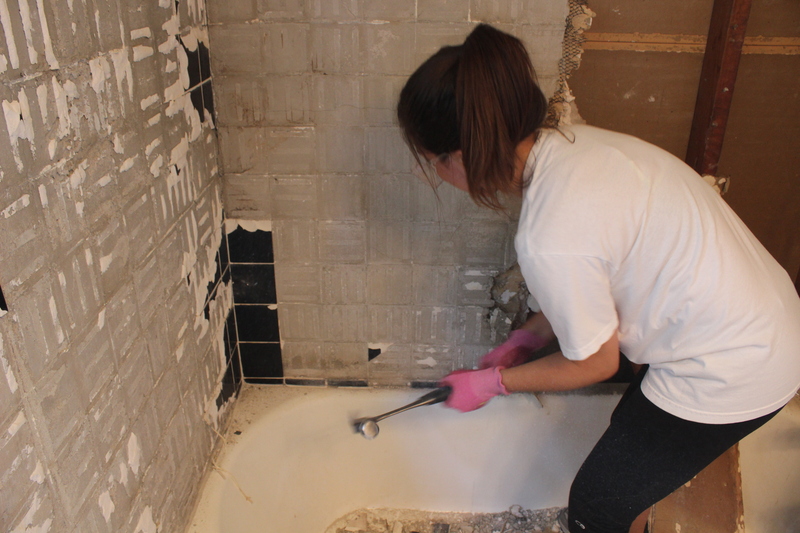 Even though there was no way we could have gotten more work done during those four days, they felt terrible leaving us an incomplete bathroom. 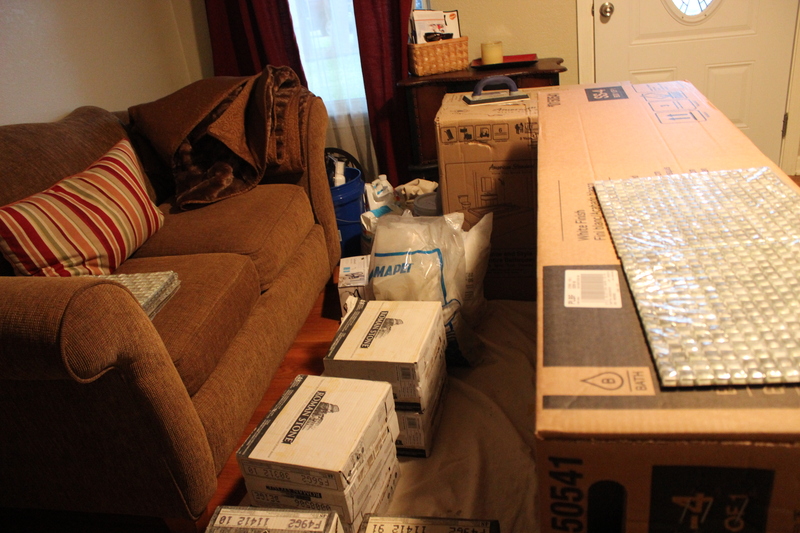 So for the next few days, my dad repeatedly asked if he could fly back out to help us wrap everything up. We knew his time and energy would be extremely helpful, but we felt bad having him fly out for a couple days on such short notice just to get this finished with us. 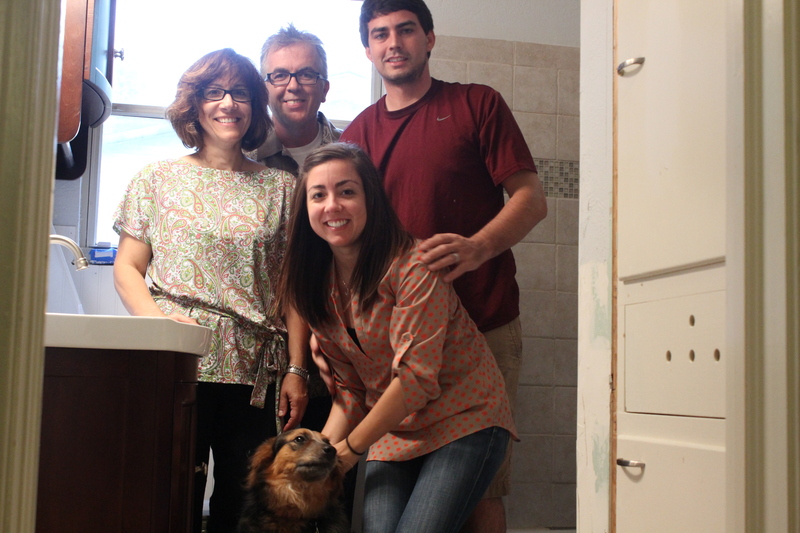 What kind of homeowners were we that we couldn’t finish ourselves? 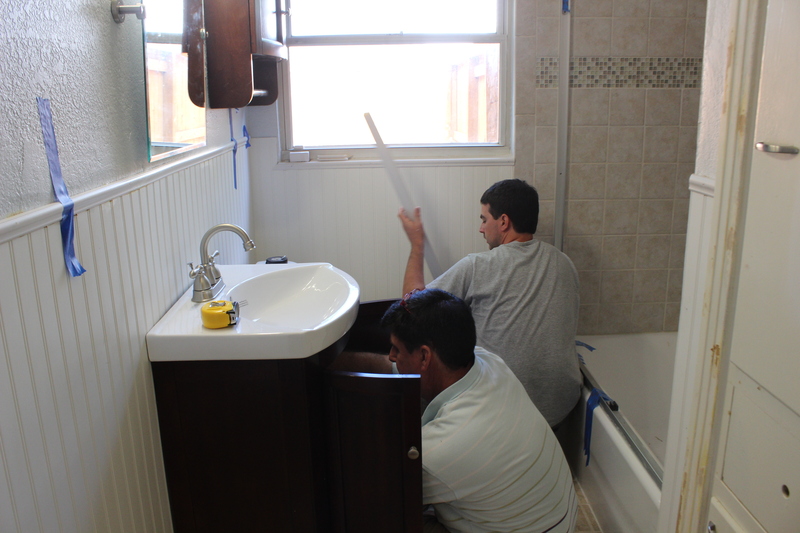 (answer: the pathetic, unknowledgeable type) After talking it over for a couple of days, we finally agreed that we needed help; we weren’t any closer to getting the shower door up, had yet to touch the trim, were clueless on the vanity and light fixture, you get the picture. That and we were so ready to be done with this project that the thought of having us work on the bathroom for multiple more weekends made me want to check in to a hotel and just avoid it all. With that, Handy Manny was back in town that next Friday and at our house by the late afternoon. 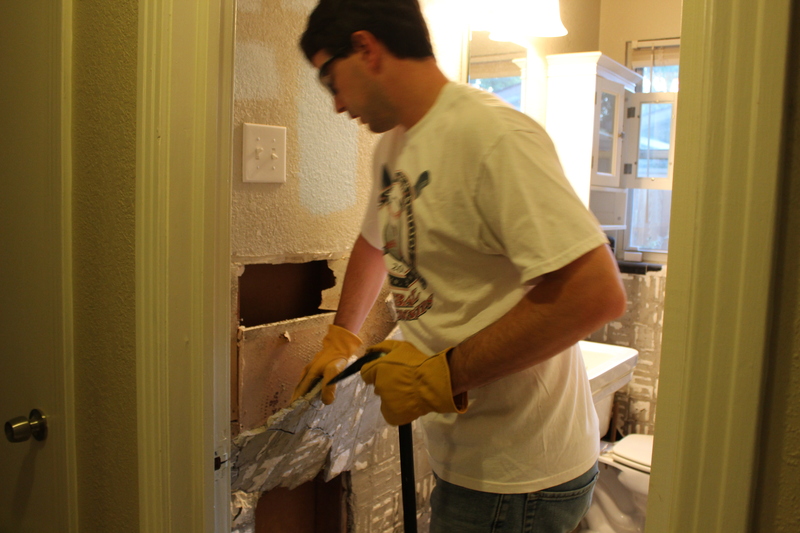 The guys got started right away, tackling that pesky shower door right off the bat. My dad was able to get a transition piece to slide underneath the bottom part of the frame and this really helped solve the problem with the sliding doors. 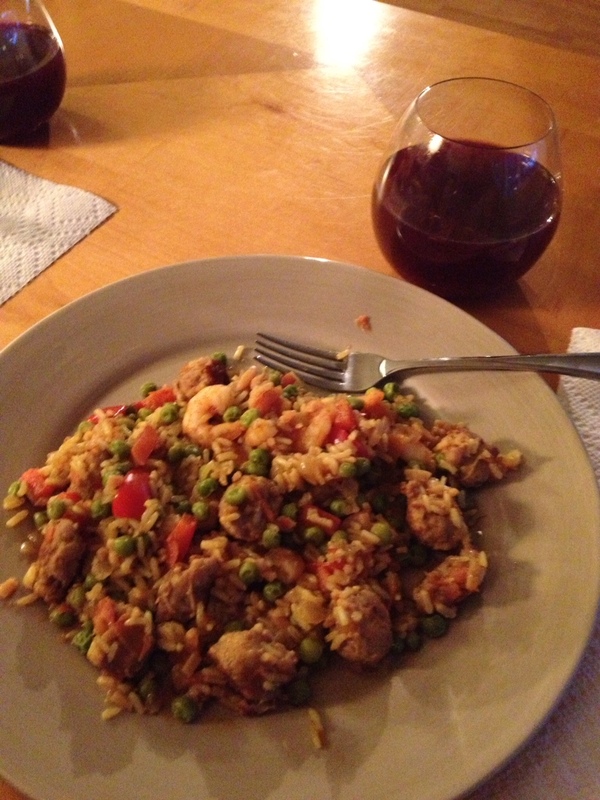 While they worked on the shower, I worked on making some paella and sangria for dinner, which was my promise to my dad for having him come visit again. Dinner was great and we felt encouraged that we would finish everything in the next 24 hours or so and even thought there would be enough time for my dad and Chip to go golfing on Sunday… that didn’t really happen, but more on that shortly. Chip’s dad also happened to be in San Antonio for the weekend, so we all met for breakfast Saturday morning at Magnolia’s Pancake Haus and then came back to our house to get to work. Those three guys were cranking through the morning! 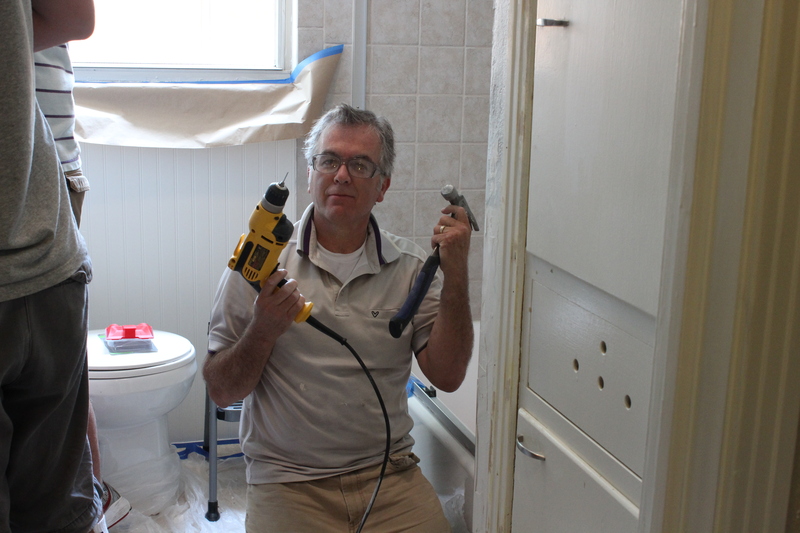 Chip and his dad got going on the second coat of paint in the bathroom while my dad showed us his woodshop skills, creating a missing piece of trim for our storage closet. It was then time to put up all the trim on the bead board, which meant I had to choose between the five different types I had purchased at Lowe’s. Trust me, it was a tough decision. 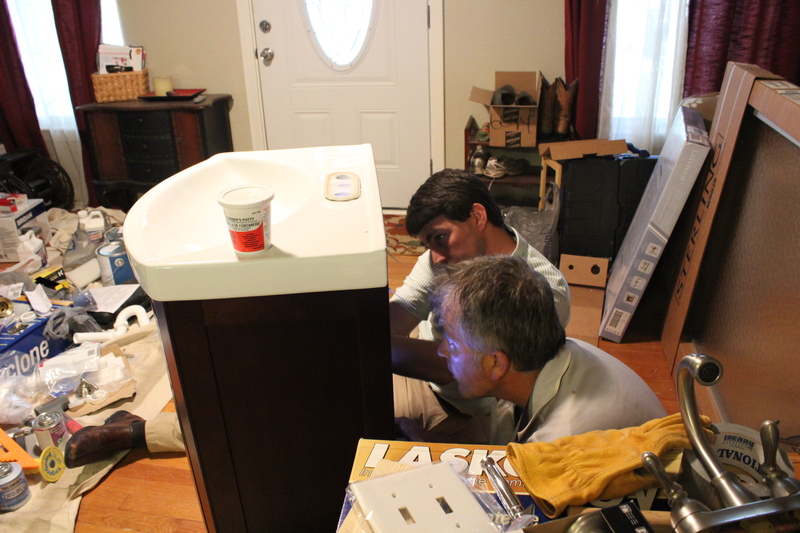 The most exciting part to Saturday’s work was when Chip’s dad successfully got our vanity installed. This was a huge deal. Remember how long it took me to even decide to purchase this vanity? Well, after that relief of having this key item purchased we realized it didn’t really fit pipe-wise with the plumbing coming out of our wall. After four or five trips to Lowe’s to try to sort through this, we were given two options: 1-cut out the storage shelf from the vanity to make all the plumbing fit (which defeated the purpose of getting a vanity with a cabinet for storage purposes) or 2-go buy another vanity. Confession: when this second option was first suggested, I thought I was going to cry in the middle of the bathroom aisle at Lowe’s. Thankfully, we didn’t have to decide on either of these options. I still don’t know how Chip’s dad did it, but he worked some magic connecting everything and was able to get it installed just perfectly without making any cuts to the shelf. Good thing Chip stopped working on it earlier in the week, we were ready to make some drastic hacks to the vanity. 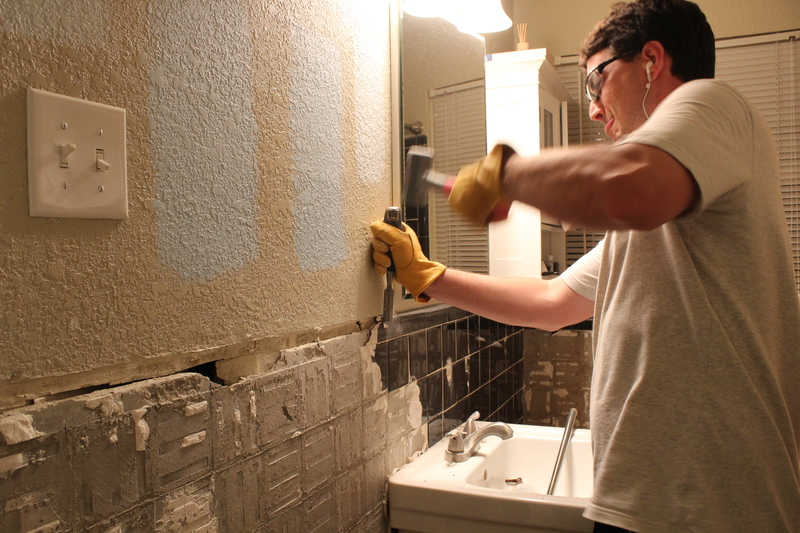 I had a bridal shower to go to Saturday evening, so while I was out, the guys did a little more work in the bathroom before having dinner at Alamo Cafe. I’m actually glad I had plans that evening and that they were all able to have a guys dinner together. Sunday morning we all met for breakfast at Cafe Salsita before going to Redeemer together. After the service, we went home to get back to work! 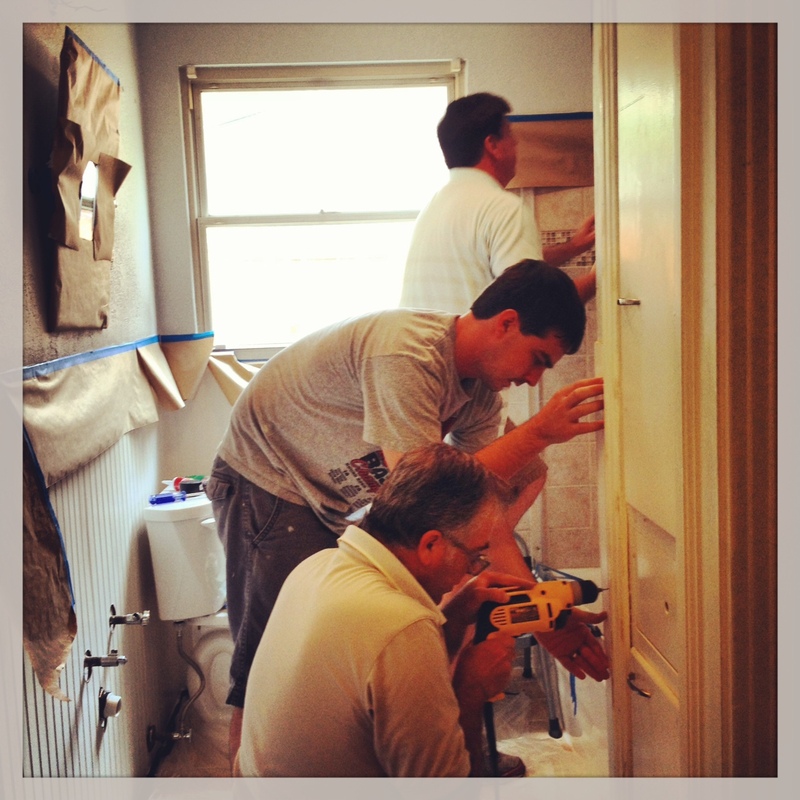 We are so grateful that our dads were able to give another full day to helping us out and getting this bathroom done! Honestly, we really wouldn’t have finished without them. That, or we would have lost our sanity trying to get finished on our own. 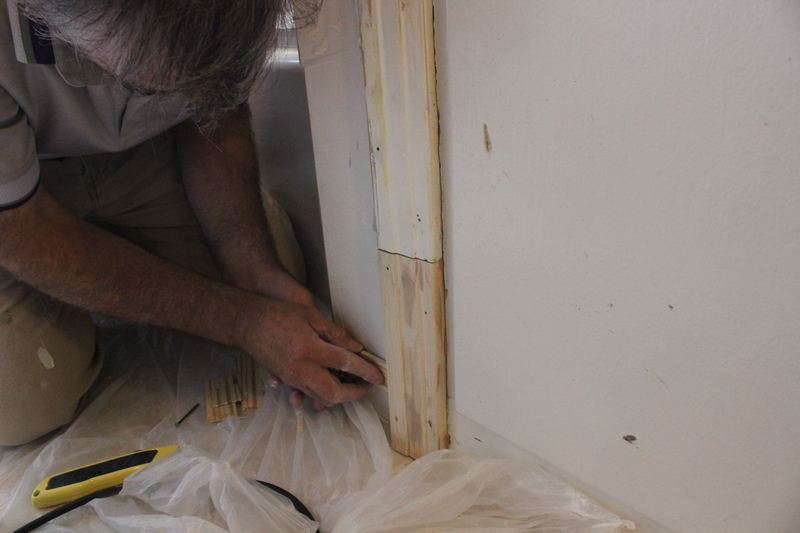 Chip’s dad carried the weight on Sunday caulking up every edge possible (Chip and I were lousy at it, we actually had to remove most of the caulking we had done… fail) while we painted the new pieces of bead board as well as the trim. We also cleaned out the storage closet and lined it with contact paper before painting the door and surrounding trim. Also, up until this point, we had the bathroom door out on the patio to help give us more space inside. We sanded the back of it, painted the edges and got it reinstalled so we could paint the back and finally have some privacy to be able to use the bathroom (thanks to Target for all of our one-item purchases so we could use their public restrooms). Using my OCD strengths to organize all the tools. By the time both of our dads had to leave late that afternoon, there were just a few last pieces to work on, so Chip and I took care of finishing the second coat of paint on the door and all the trim. After that, I finally got to start decorating our bathroom. My parents had gotten us some awesome fluffy white towels as part of our two-year anniversary gift in anticipation of this project and I couldn’t wait to get these out and ready for use. We also had a cute little bathroom care package from my mom and were able to use all the different peices to bring our bathroom together. Thanks for the gift, mom! And here are the pictures of the final result! 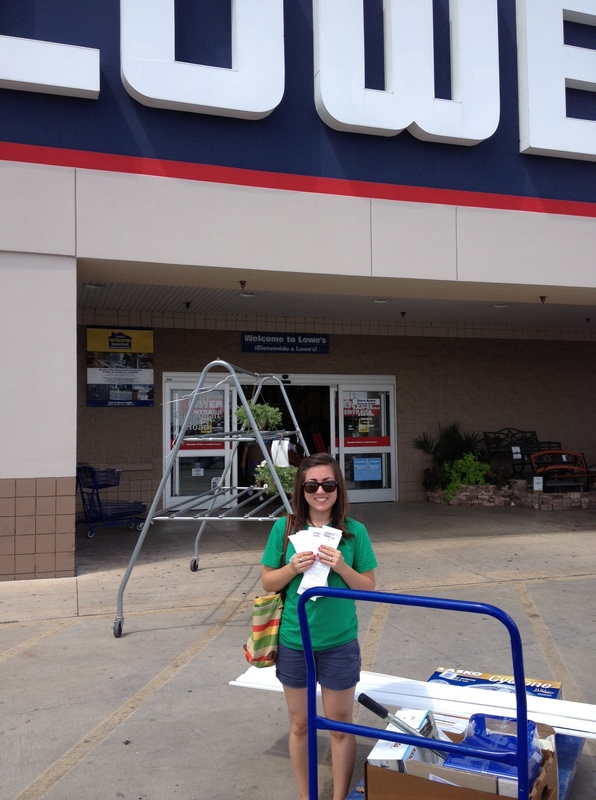 Taking all 20-something receipts with us to Lowe’s for some returns at the end of the project. 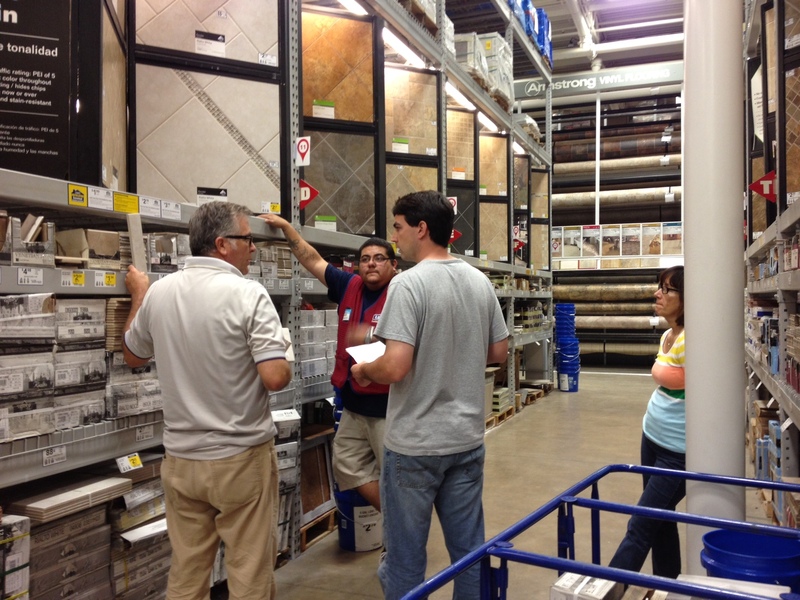 Side note: all of the Lowe’s employees we worked with were amazing, always helping us find what we need and give us any tips. I know we’re a little biased, but we think the bathroom looks pretty darn awesome. It’s so much better than what we had ever expected and we love that this project has given us so many fun memories and stories to share with our families. While the bathroom is pretty much 100% done, there are a few things we still need to do: hang up the towel rod on the back of the door, find some fabric to make a Roman shade for the window, do a few last paint touch ups, and hang up a couple of frames with some pictures from our trips (how cute would a Nantucket landscape look in here?). 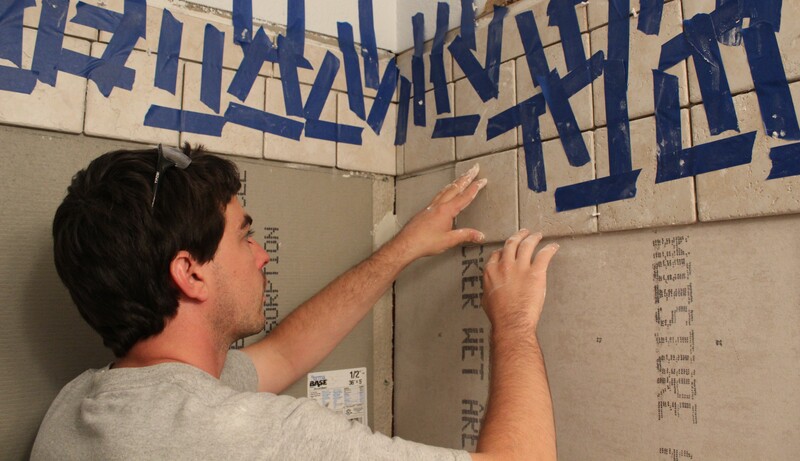 We’re going to take our time on those details and just enjoy this bathroom for now! 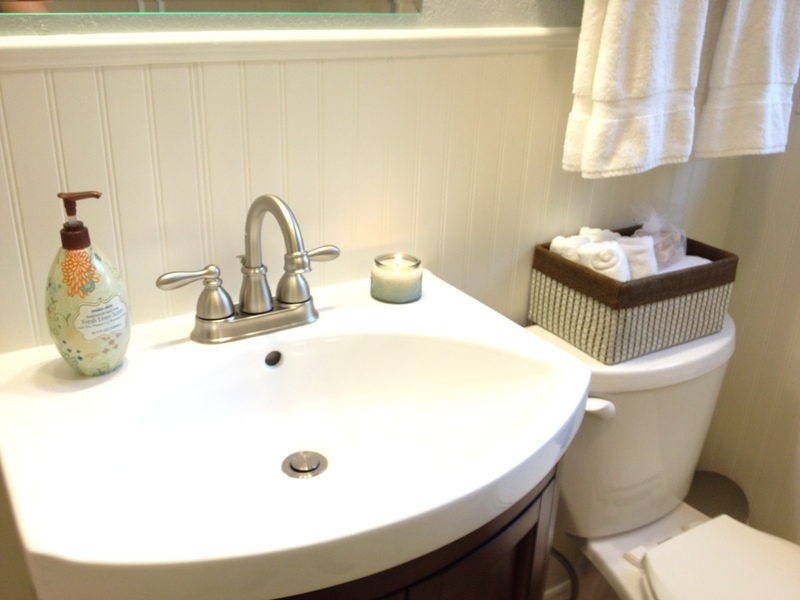 This entry was posted in DIY, House Projects and tagged bathroom, DIY, home improvement on August 11, 2013 by the nance familia. 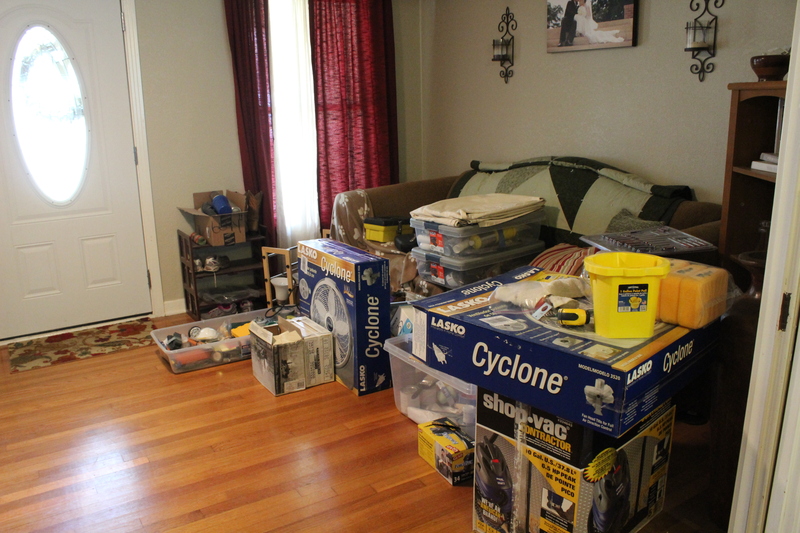 After our first long trip to Lowe’s Thursday night, my parents came over early on Friday morning and we all got started to a long day of work. 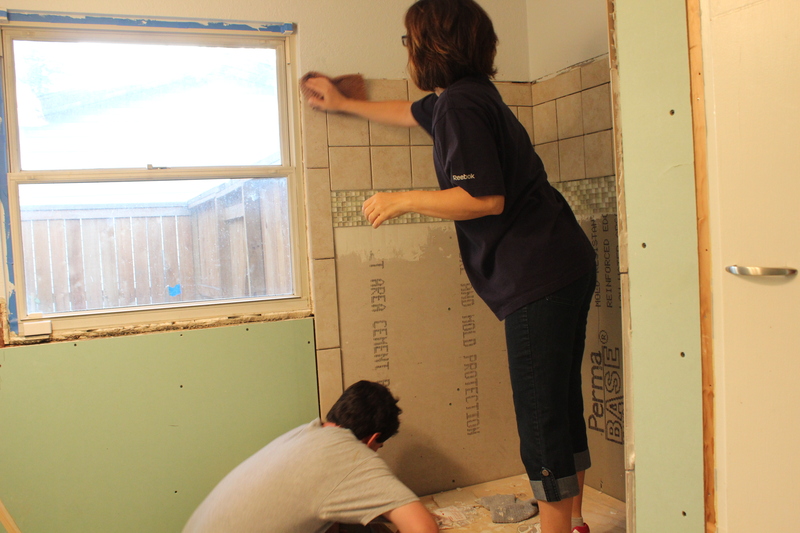 We got the day started by taking out the rest of the tile that we still had in the shower and hammering out the cement board so we could soon get the tub installed, put up some new backer board, and start installing the tile. 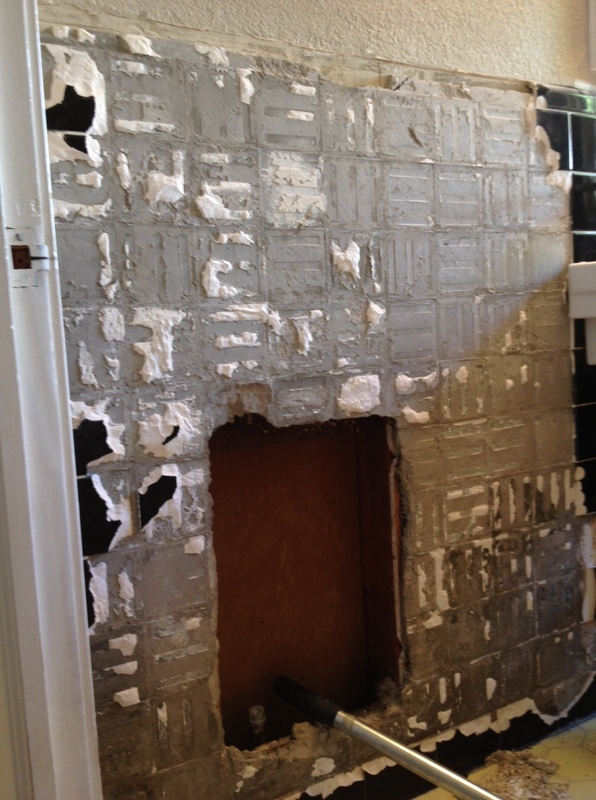 By the time all the cement board was hammered out, I had a conference call for work so I stepped outside for a bit. 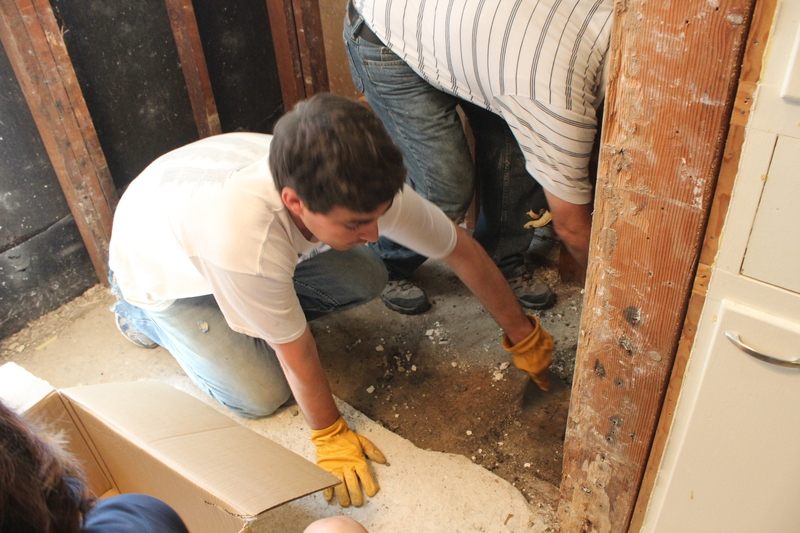 During that hour, the guys were able to remove the toilet as well as get the tub out of the bathroom. Now we had originally considering having the tub professionally removed instead of trying to do it ourselves; thinking about its age and size we figured it would be extremely difficult to get the tub out and had been told by the plumber that removed our old bathroom gas heater that we may even need to get it out in pieces because of its weight. We were worried that it would take us at least an hour or two trying to do this ourselves whereas a pro could do it without breaking a sweat (or so we thought). In the end, we decided to save money and just try to do it ourselves. Thankfully it wasn’t as difficult as we expected and the hardest part for Chip and my dad was just carrying it out of the house. We were clearly off to a strong start. We tried getting Wrigley in the old tub. He didn’t think it was a good idea. And that’s when we ran into our first bit of trouble. 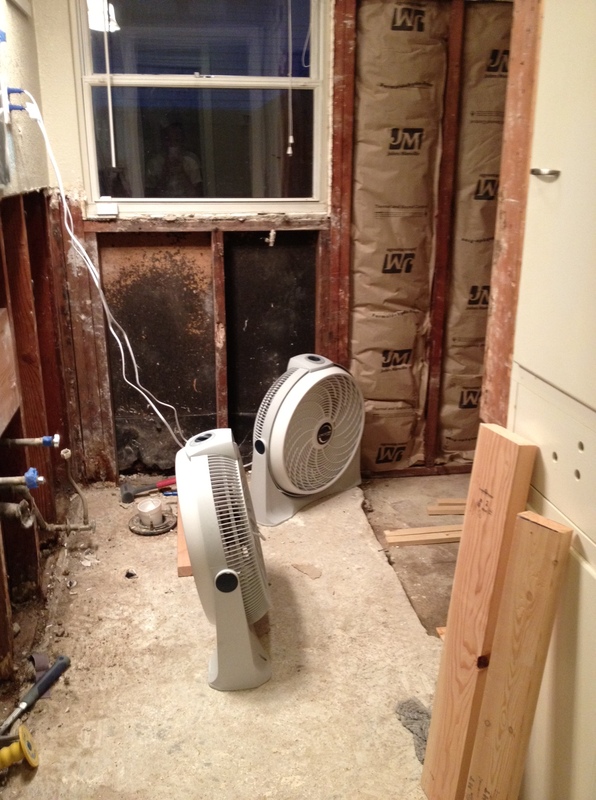 Turns out some of our 2×4 beams that had been under and behind the tub had water damage. No bueno. 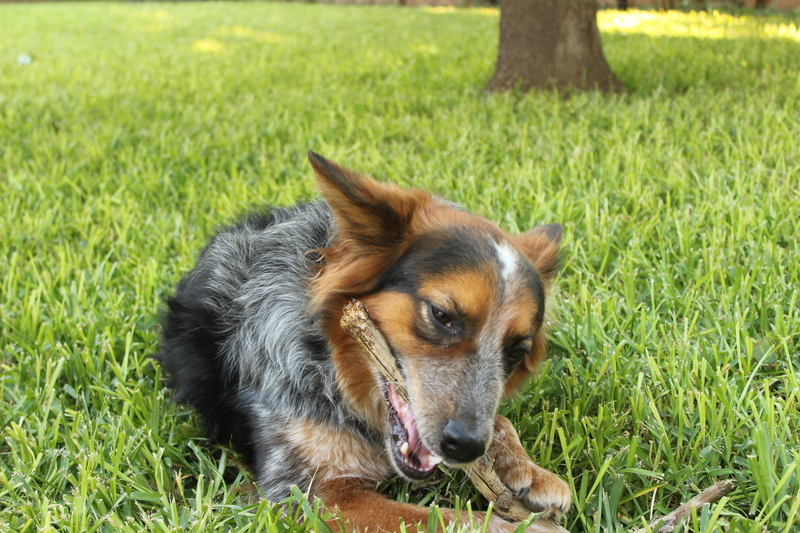 As Chip likes to describe it, the wood was so rotted through in some places that you could scoop it out with a spoon. Yikes and gross. Guess it was a good thing that we decided to replace the tub, otherwise we would have unintentionally kept this water damage going for who knows how long. So needless to say, we had to reinforce those pieces of 2×4! 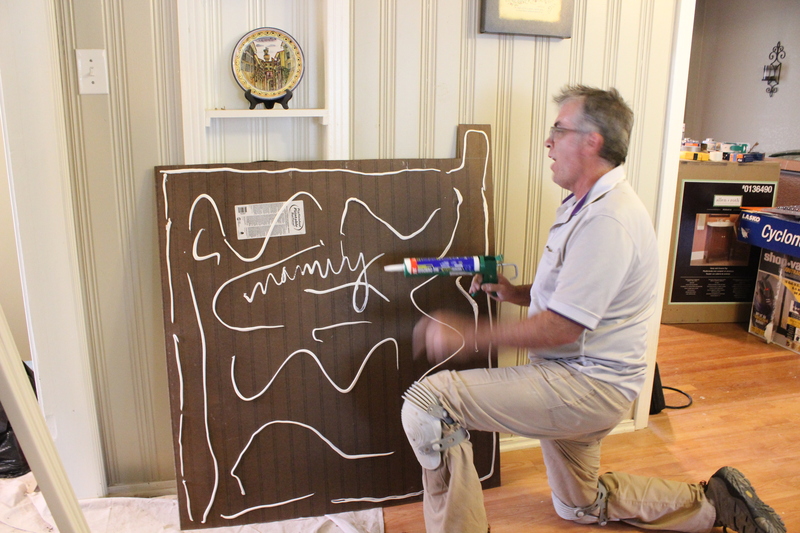 We also went ahead and sprayed some anti-mold treatment, just to help address the water damage we encountered. 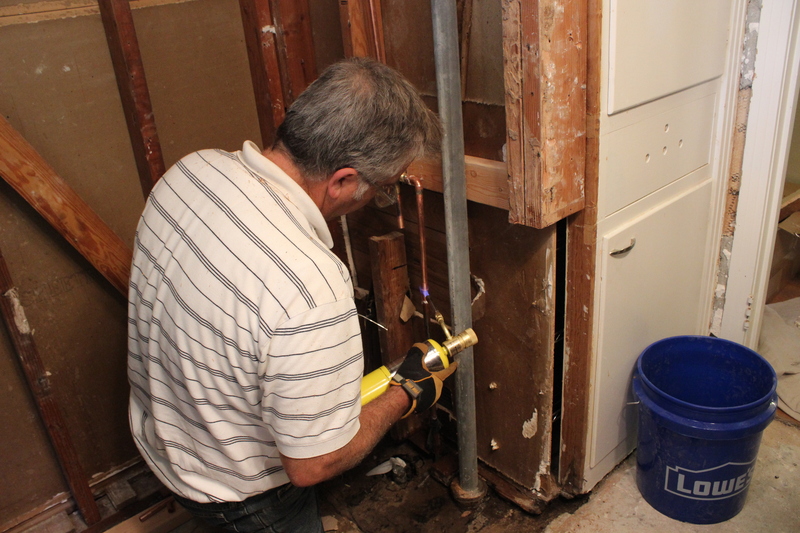 We also had my dad act as a plumber for a few hours… our old tub fixture had two separate valves for the hot and cold water, whereas the new fixture we had purchased at Lowe’s had just one valve. So we (my dad) had to solder this new valve as well as raise it higher to the recommended height from where the valves originally were. Definitely something we weren’t anticipating having to do that weekend! It took a bit of time to get this done, but definitely important to take our time and get it right. 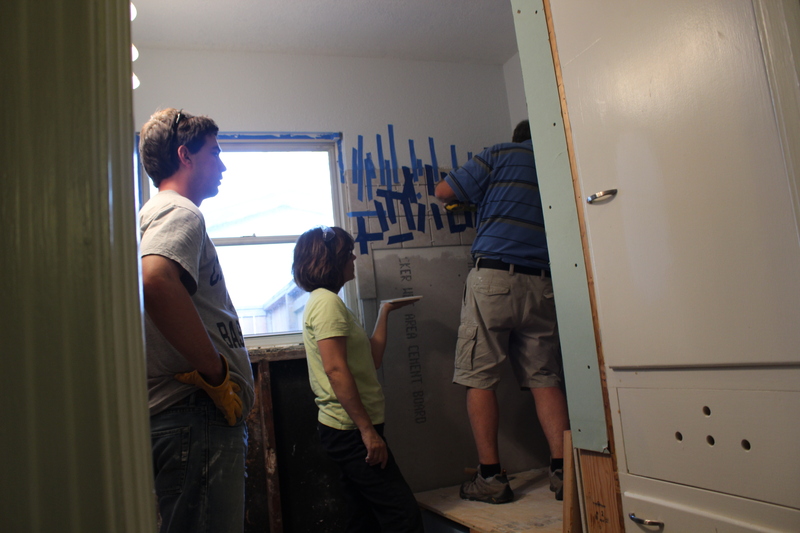 We were originally hoping to have the tub installed and the tile in the shower area done by the end of Friday. 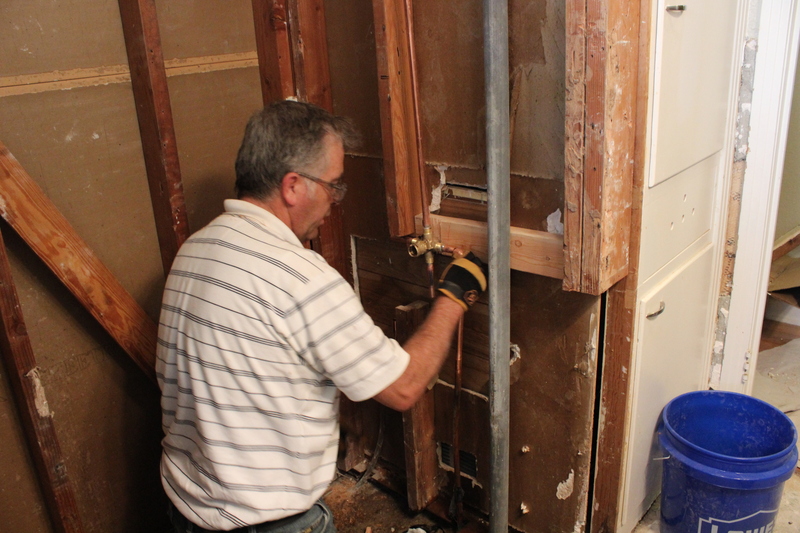 With all the plumbing work we had to do, we had to end the day without either of those two tasks and instead have some fans run all night to make sure everything was dry before installing the tub on Saturday. 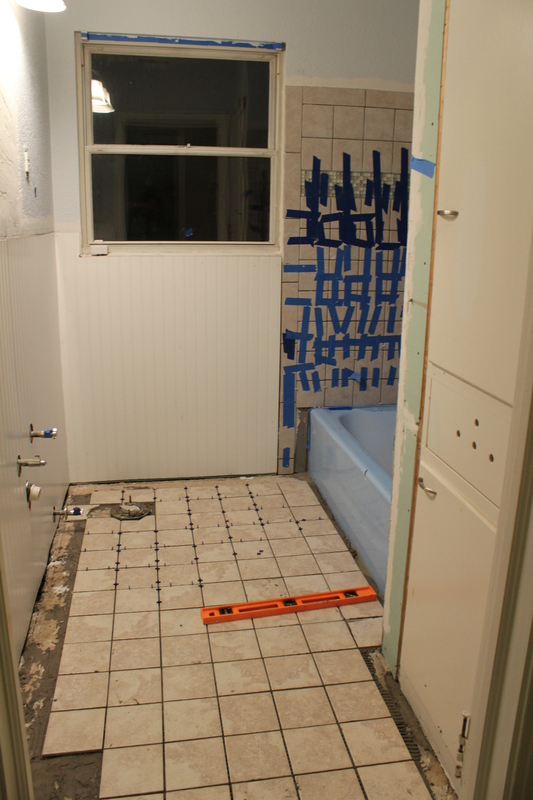 Saturday’s priority was to get the tub installed and get the tiling done. We couldn’t put the tub in right away, we had some leveling work to do first, which I don’t know all the details of since I was running to Lowe’s as needed for random purchases throughout the morning. 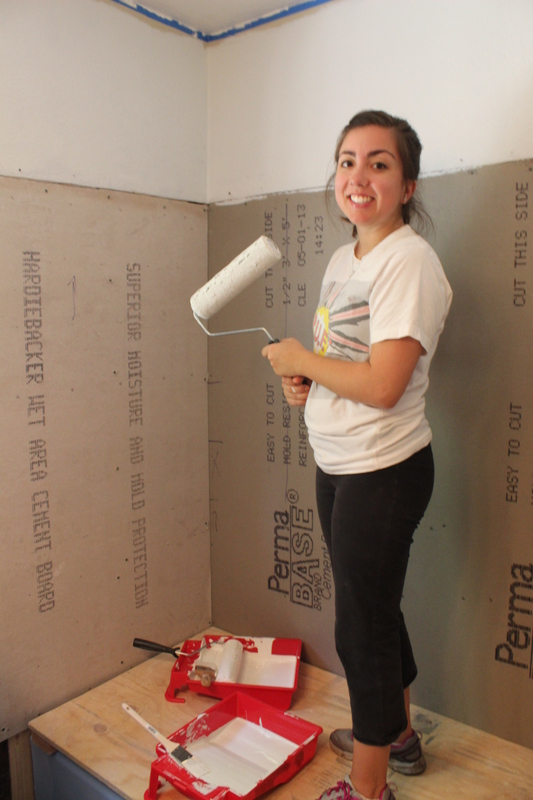 By lunch time the tub was in and my mom and I got to painting. We did two coats of Benjamin Moore’s Glass Slipper on the walls and I started to doubt the idea of having Cloud White on the ceiling. It was just so… white. I don’t know what I was expecting, but it threw me off initially and I did a great job voicing my concerns while my mom diligently did the first coat. I even compared it to a hospital at one point. Overly dramatic? I’ll just say it was my vocal Lopez genes. Many thanks to my family for putting up with me debating back and forth if the white was a good idea (in the end, I really liked the white and love the way it looks now). 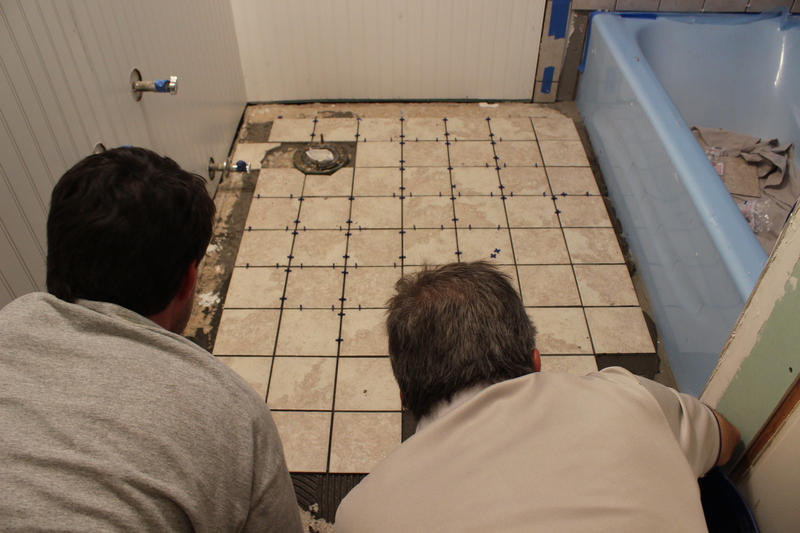 By the evening, we were finally ready to get going on the tile! 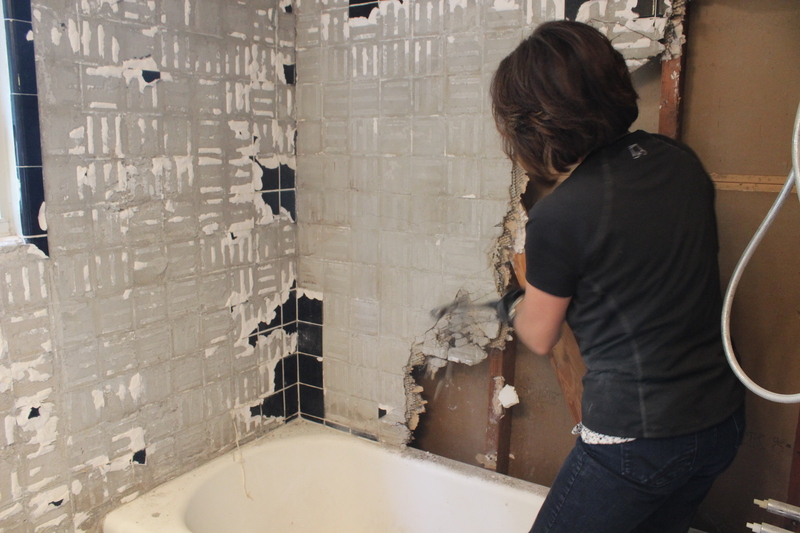 This was probably my favorite part of the whole remodeling process and has made us fairly excited for a future project of re-tiling the kitchen, laundry room, and guest/entertainment room. 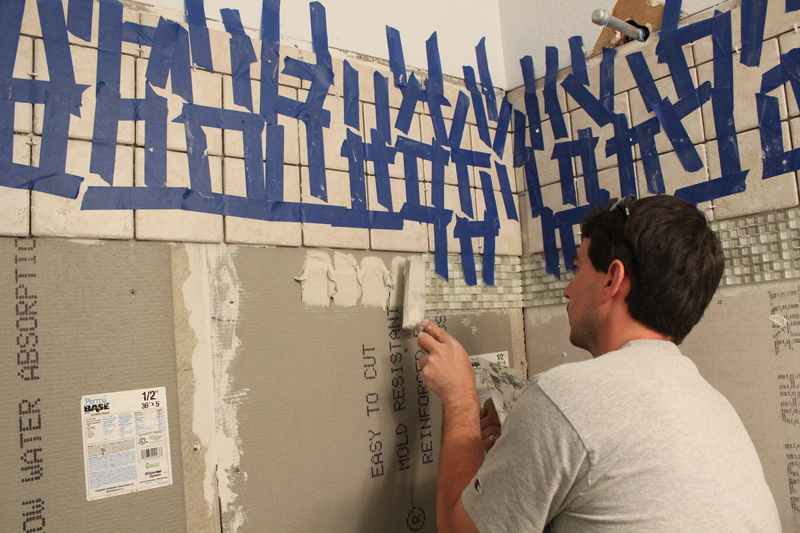 Chip quickly became a pro at laying down tile and I’d like to think I got pretty good at measuring and cutting tile over the course of the evening. 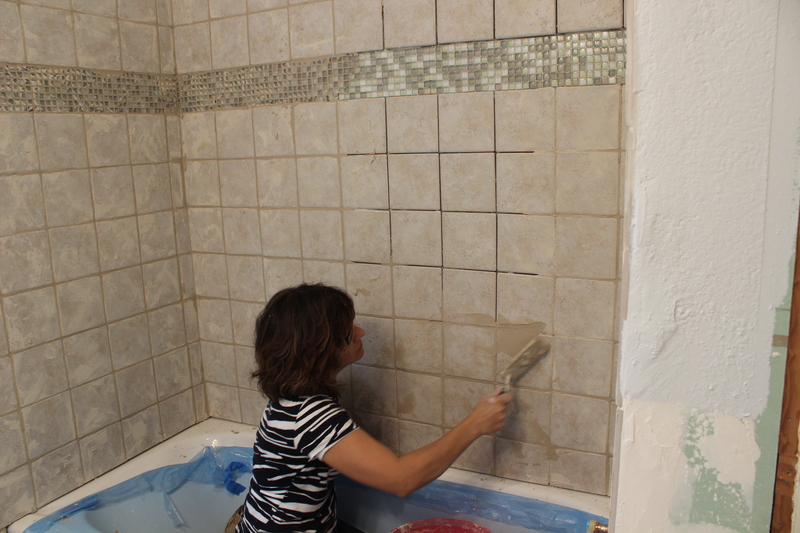 The hardest part of the day was putting up the little glass tiles as a border near the top of the shower. It took us a while to figure out how much thin-set to put on these strips of glass tile and I was pretty much ready to just toss these out and return them at Lowe’s, but thankfully Chip figured out the best way to get these up. By the time we had the row of glass tile up, it was quickly approaching midnight so we called it a day and showered at my parents’ hotel. While we were behind schedule, we were happy with the progress we were making. Still, we knew we had our work cut ahead of us for Sunday! 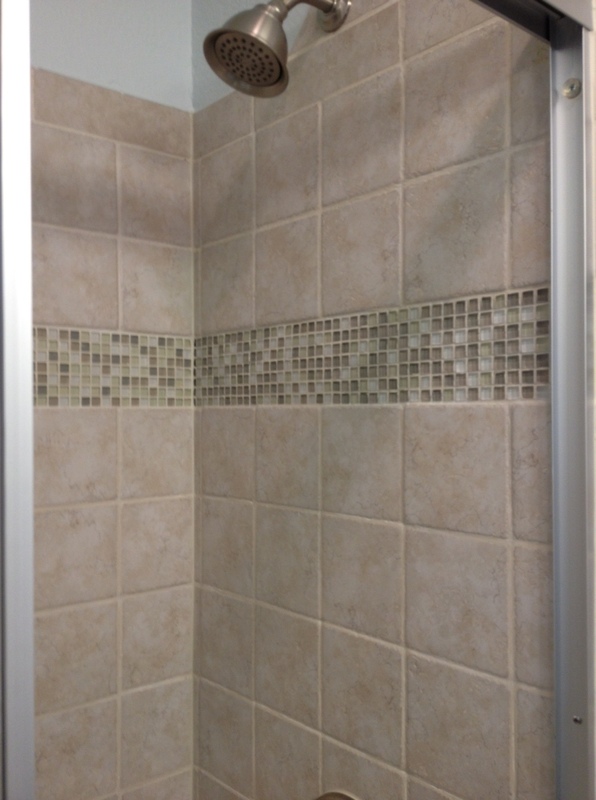 We were able to finish tiling the shower and got most of the floor tiled as well as put up the bead board. My dad autographed the back of the bead board. He’s a champ. 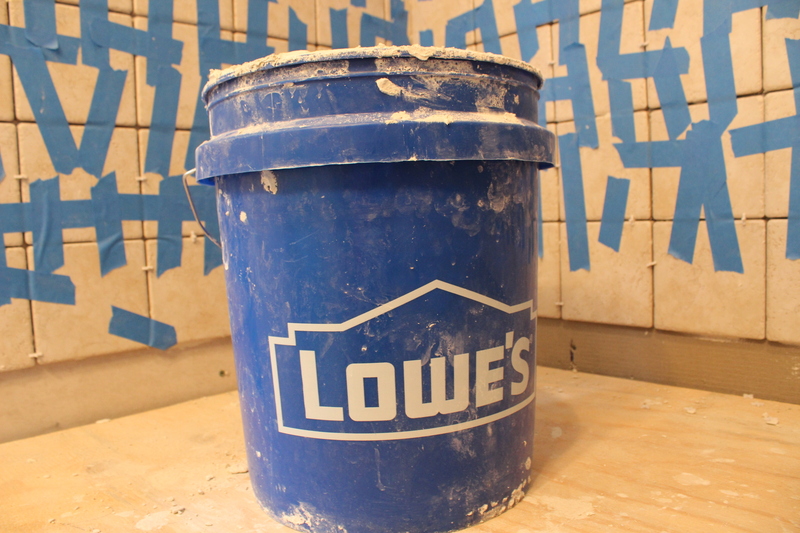 This remodeling has been brought to you by Lowe’s. Let’s build something together. Unfortunately, for as much work as we did finish on Sunday, we didn’t get as far as we had wanted (surprised? ;)). 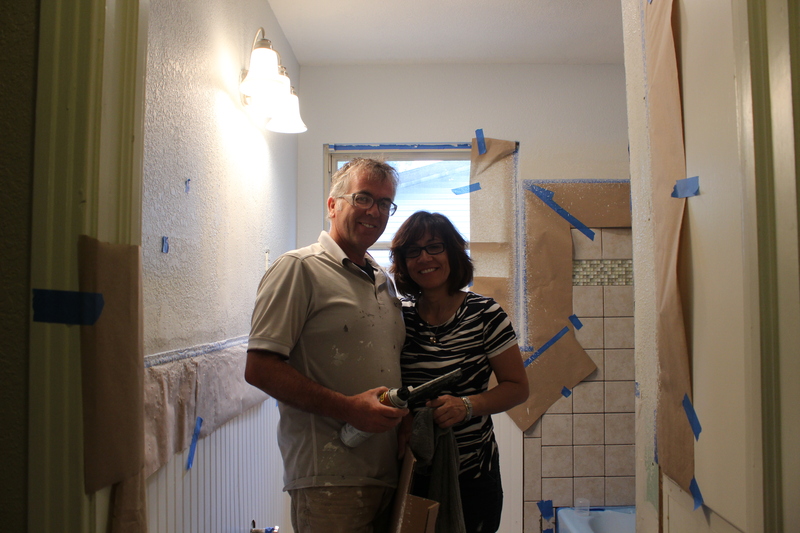 Thankfully my very gracious parents rescheduled their flight from Monday morning to later in the afternoon so they could keep working on the bathroom while we were at work. 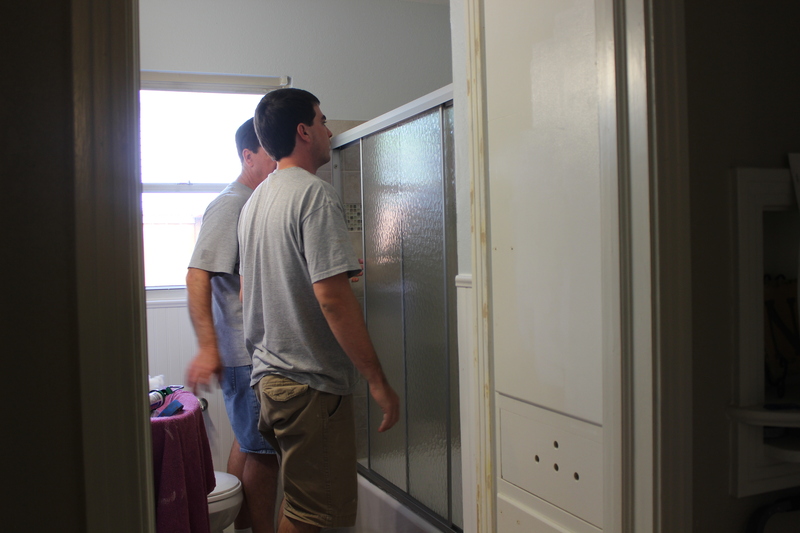 We still had a chunk of work to do on Monday: grout all the tile, install the toilet, purchase and install the vanity, put up the new light fixture, purchase and install the new mirror, cut little pieces of bead board around our bathroom closet, etc. 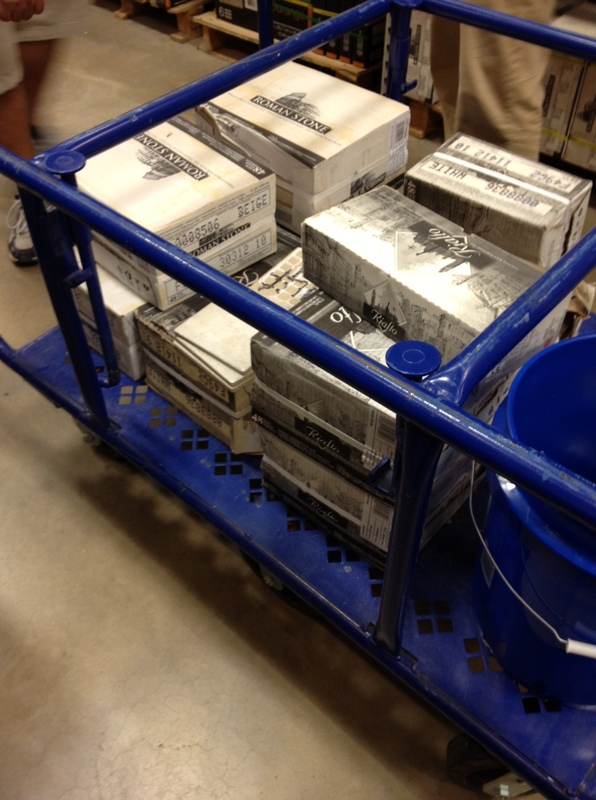 So my parents came over at 6:00 in the morning and my mom and I went to Lowe’s for the up-teenth time while the guys Chip and my dad got going on some of the remaining perimeter floor tile. 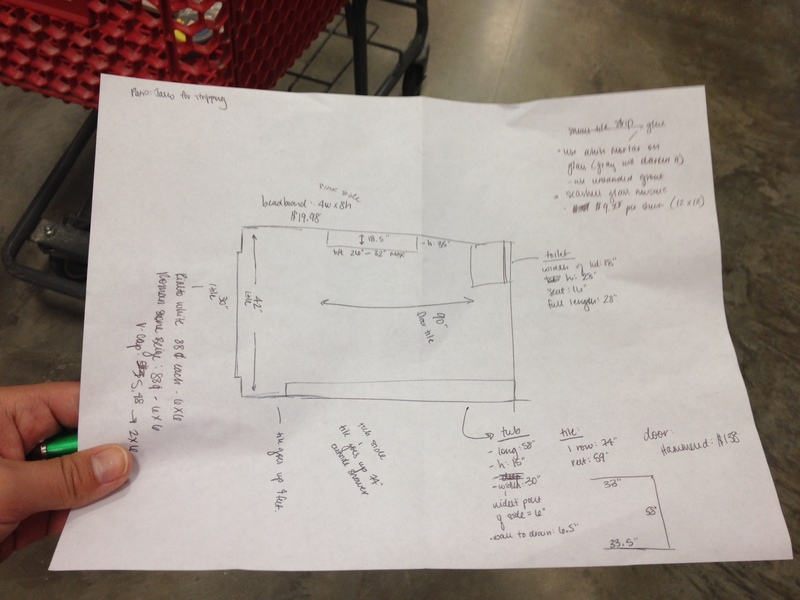 Note: the benefit to being the first people at Lowe’s as soon as they open is having lots of employees helping us find what we need and not having to wait in line at the check-out counter. I’m happy to say we finally found a vanity that we liked as well as a few last items. 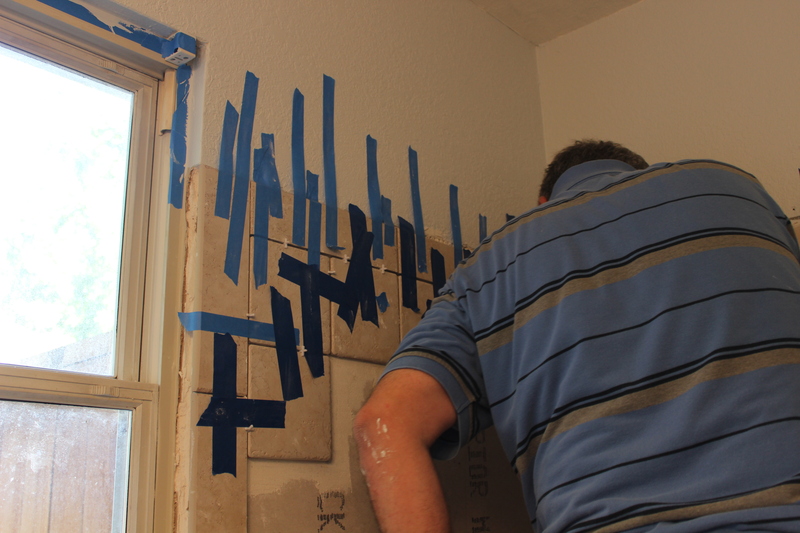 We came home and helped with some last bit of tile cutting and thin-set mixing before heading out to work for the day. 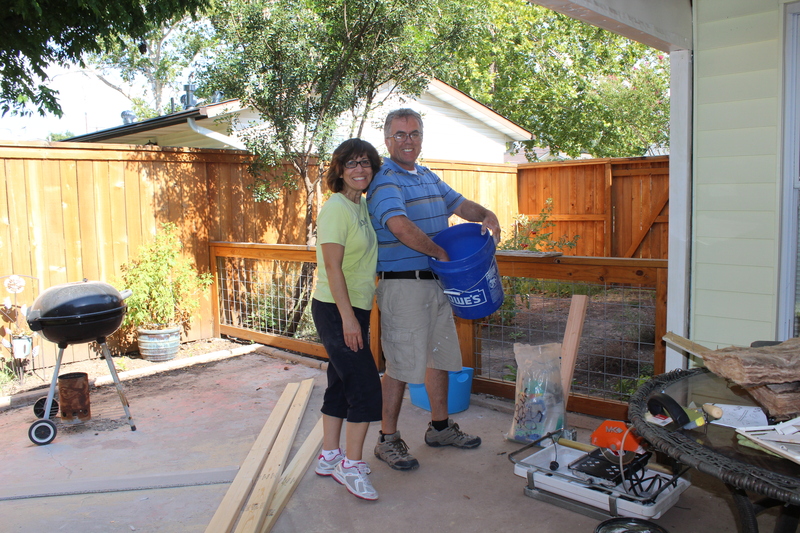 I felt bad having my parents working on the house while we were gone, but they felt terrible leaving us with work once they had to fly back to Arizona. This entry was posted in DIY, House Projects and tagged bathroom, DIY, home improvement, paint on August 7, 2013 by the nance familia. 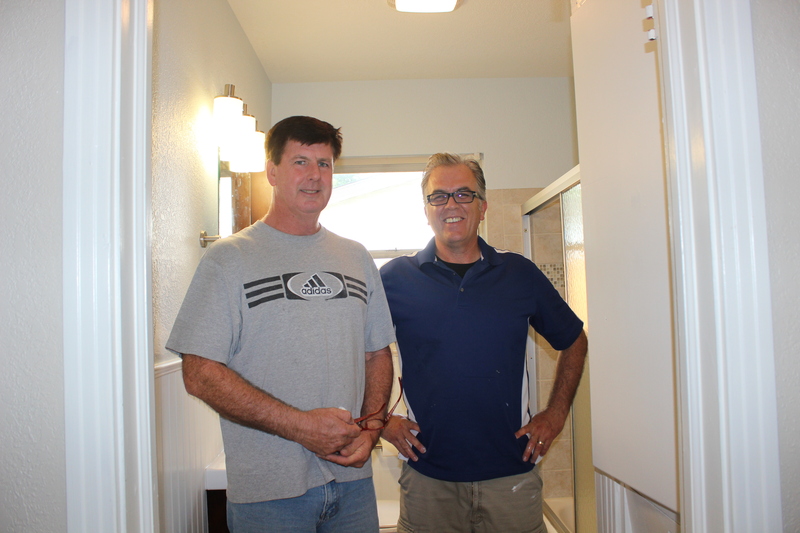 As I mentioned in my last post, Chip and I finally got to remodel our bathroom. 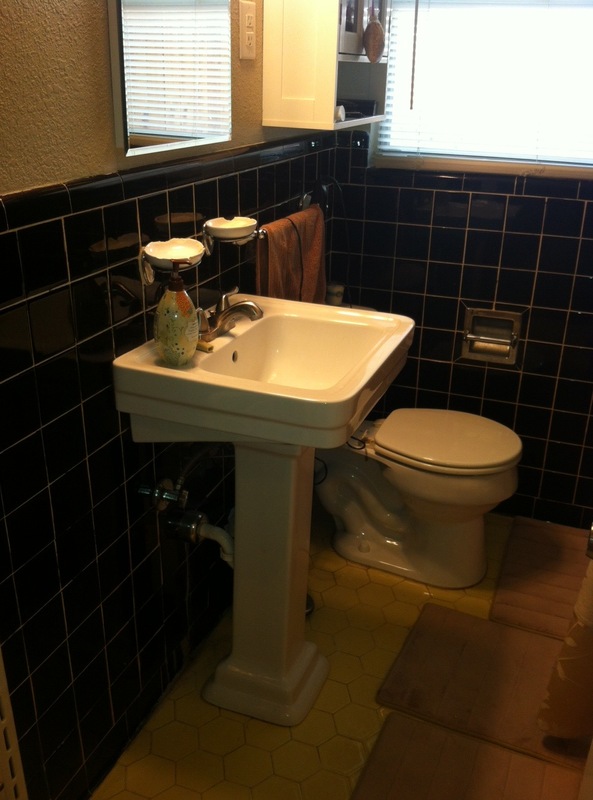 When we first talked about this project, we weren’t thinking too big, we really just wanted rid of the awful yellow floor tile and find some type of solve for the black wall tile (we even discussed painting it thanks to something I had seen on Pinterest). Then we considered taking the black tile out of most of the bathroom and just leaving it in the shower hidden behind a curtain (classy, right?). 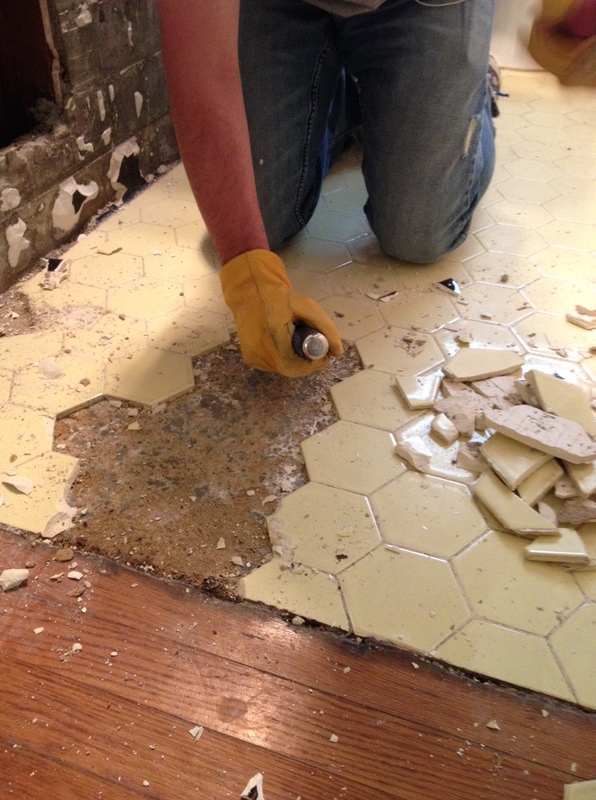 Then we decided to get rid of the black tile all together. We soon started talking about getting a new vanity; we had a pedestal vanity and thought it would be better to have one with storage. 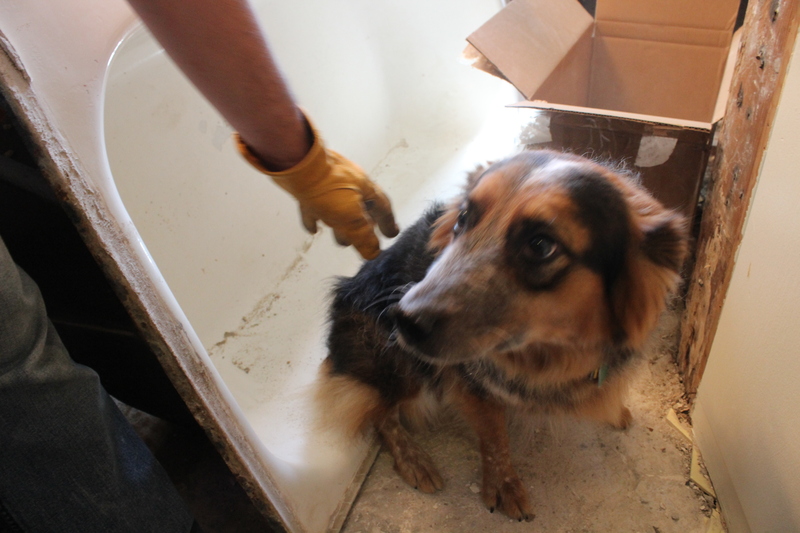 Chip also disliked our tub since it was so old and big, so he started a campaign to get that replaced as well. 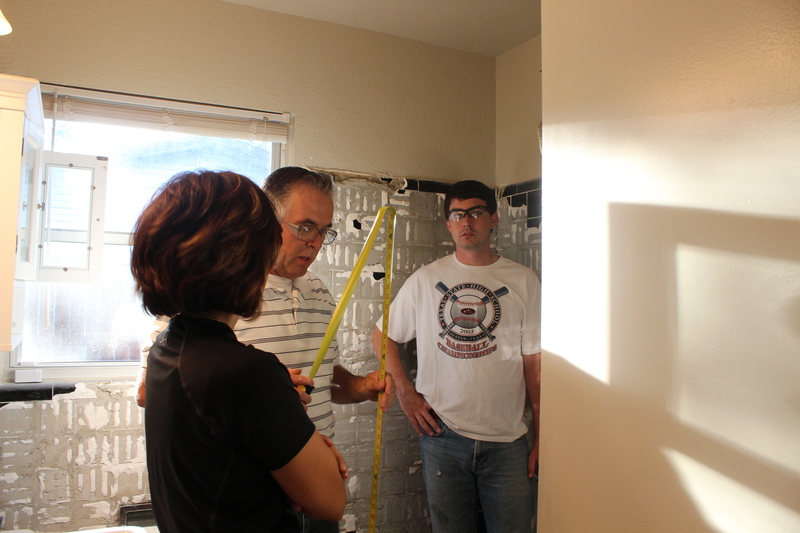 By this point, we were consulting with my parents on how to tackle this project and my mom agreed with Chip’s plan to replace the tub and suggested we do the toilet as well, since everything else was being updated. 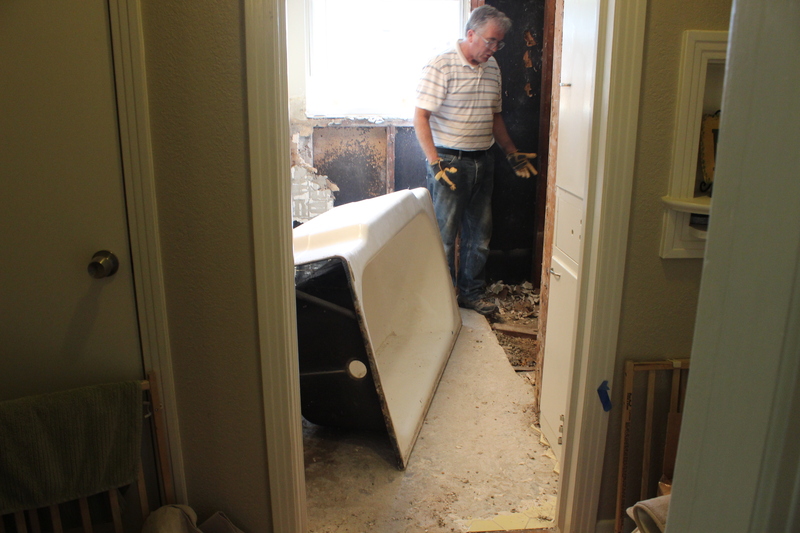 Suddenly we had a major remodeling project on our hands. 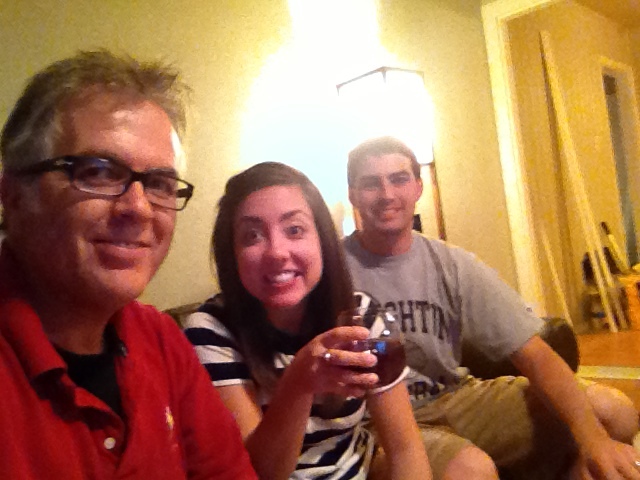 Thankfully, my parents were more than willing to fly out and help us for a long weekend! 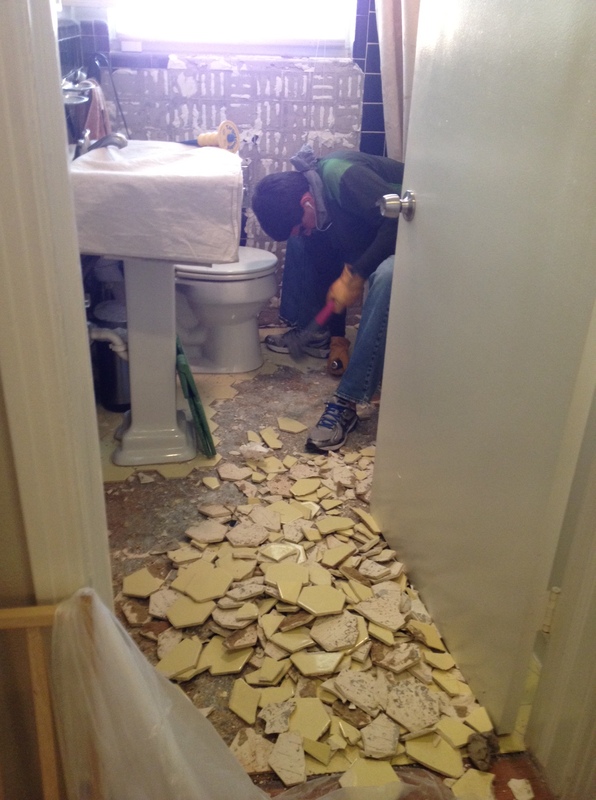 Once we picked the dates for my parents to come out, Chip got to work getting rid of as much of our old tile as possible so we could get started right away when they came to San Antonio. He got the hang of it pretty quickly! 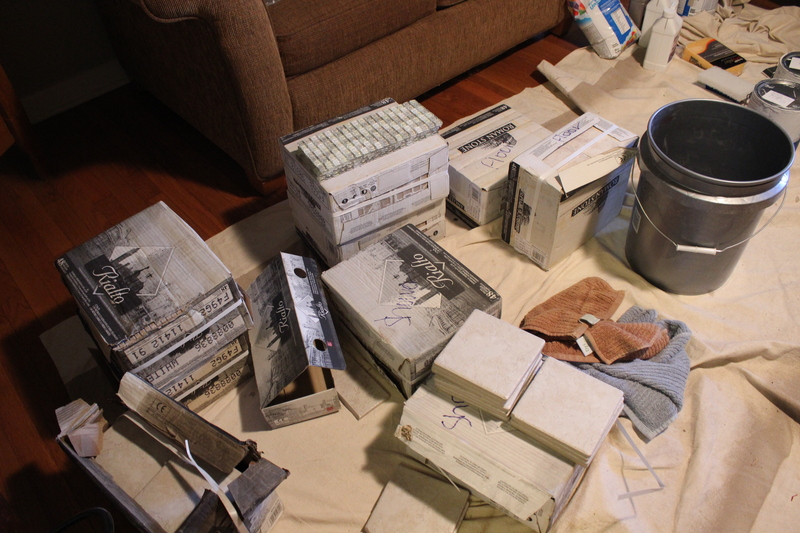 While Chip worked on the tile, I set out to find some paint for the room. 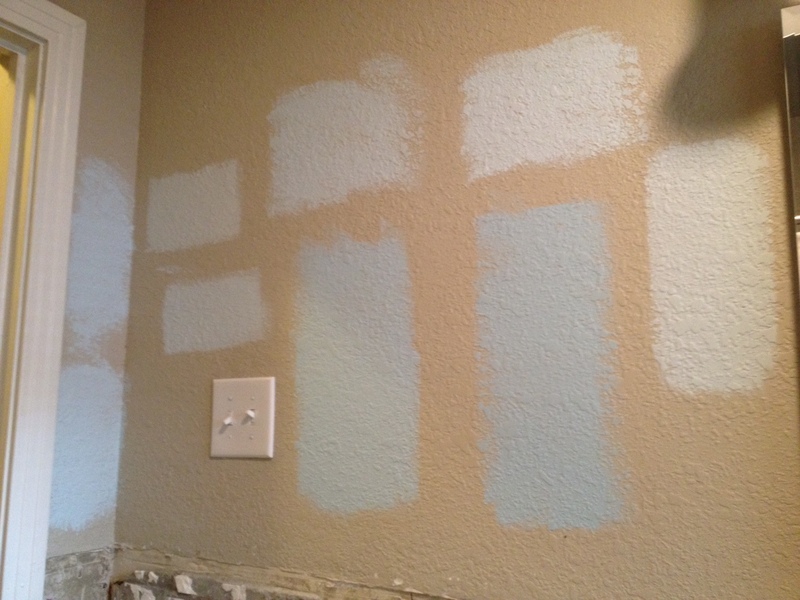 Overall, we knew we wanted the bathroom to be much lighter than it currently was and after some initial trips to Lowe’s, we were leaning towards light tan-ish floor tile, white bead board, and a light blue paint for the rest of the walls. After talking to my friend Haley about different types of paint, she quickly sold me on getting some from Benjamin Moore. Six samples later, we finally found a color we were happy with. 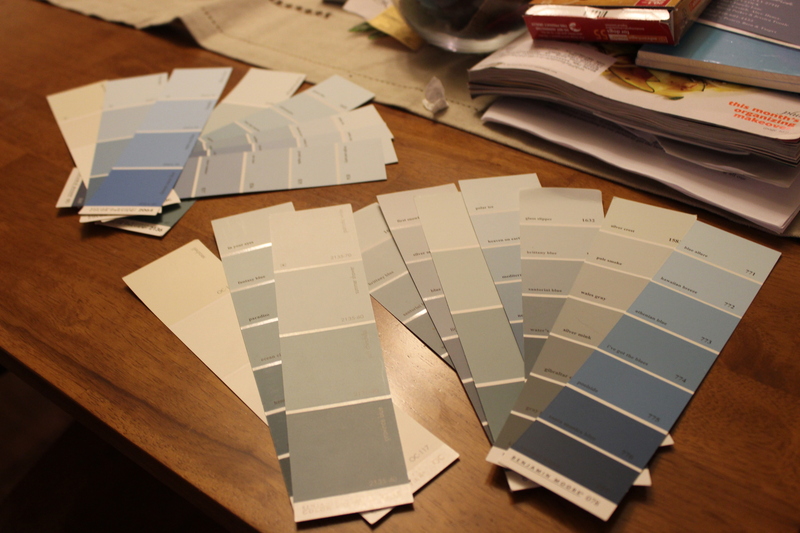 The first few samples we bought were less light blue and more along the lines of “Congrats! 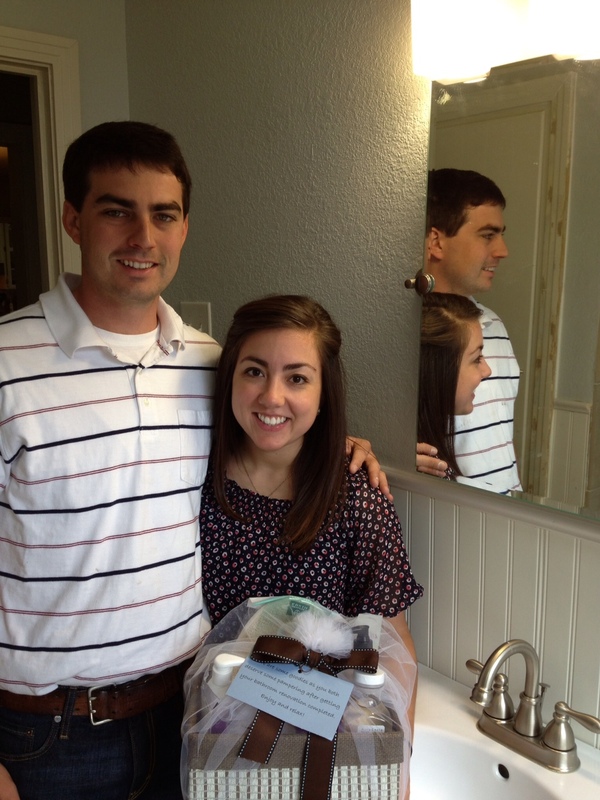 It’s a boy!” blue… not exactly what we were going for. So at the end of the trips to Sunset Ridge, we finally decided on Glass Slipper for the walls and Cloud White for the bead board and trim. I carried the paint chips around everywhere for a couple of weeks. Some of them are now bookmarks. Good recycling, right? 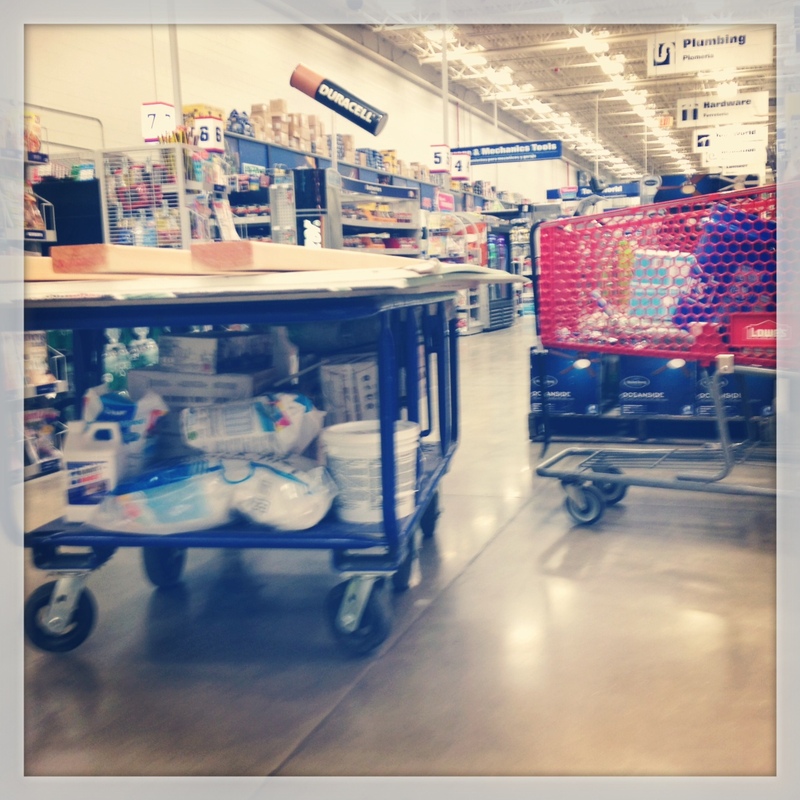 My parents got into town on a Thursday evening, so after a quick dinner at home, we made our way over to Lowe’s ready to purchase everything. 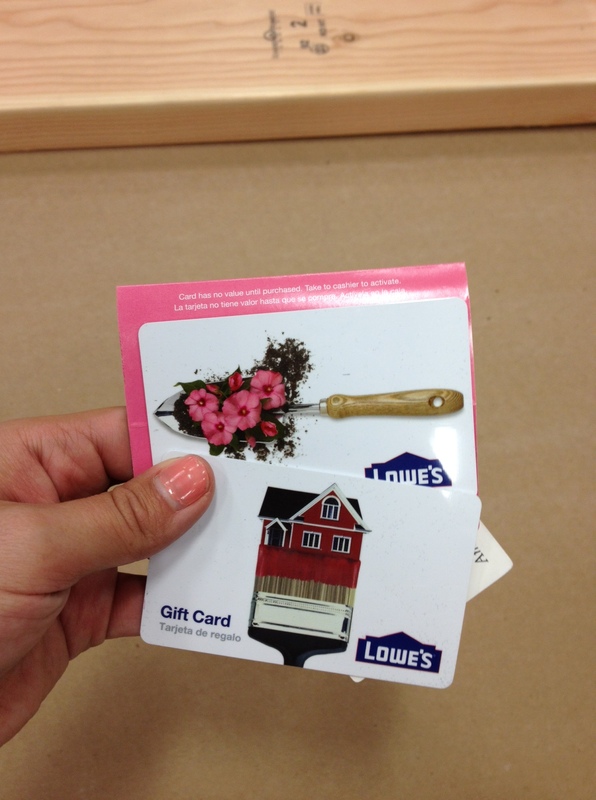 Thankfully we had a couple of gift cards as well as a home project fund we had been working on for a while to help cover this project. 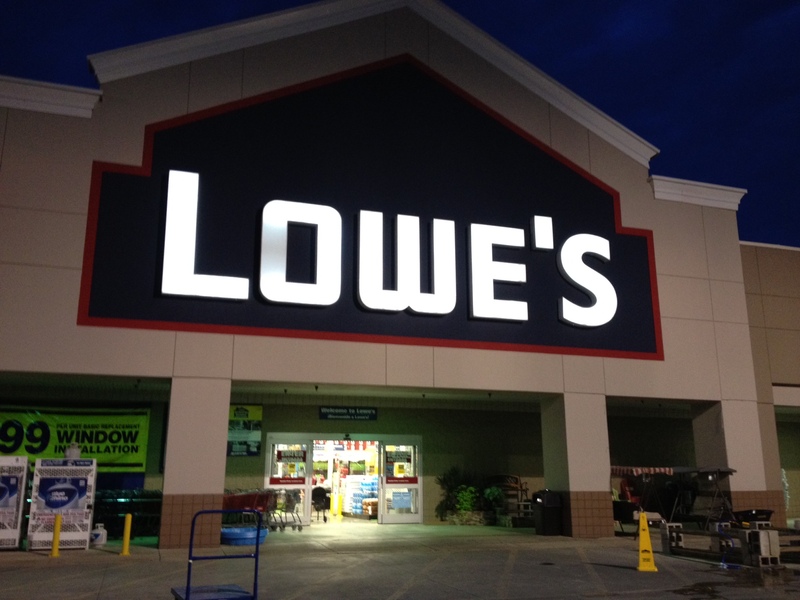 By the time Lowe’s was getting ready to close on Thursday night, we had everything we needed to get to work early on Friday morning! This entry was posted in DIY, House Projects and tagged bathroom, DIY, home improvement, paint on August 4, 2013 by the nance familia. That’s right. 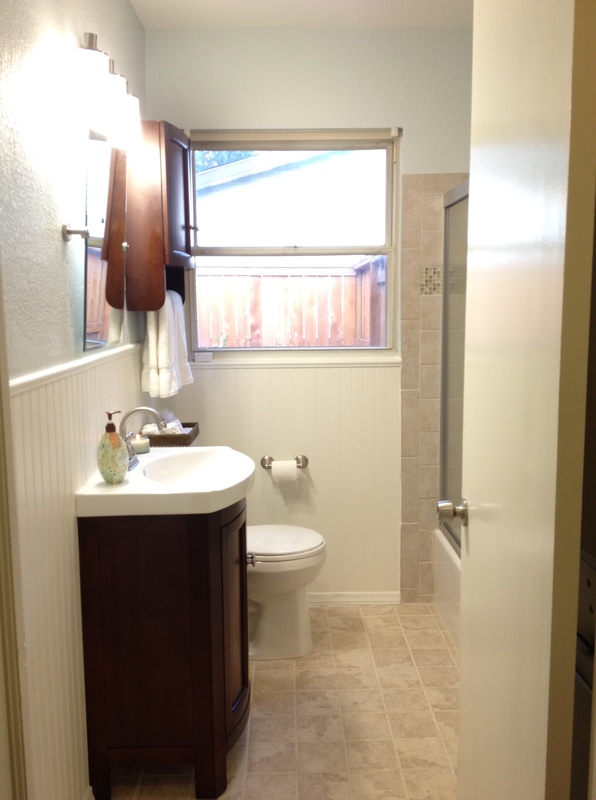 We (finally) finished remodeling our bathroom! I’ll be posting throughout the next few days details on the actual process, but for now, here’s a reveal of what our bathroom looks like now. And here’s what we have now after 22 trips to Lowe’s, 3 trips to Home Depot, 3 trips to Fergusons, and 5 trips to Sunset Ridge Home and Hardware. So happy. A much needed improvement. Hooray for a new serene space. 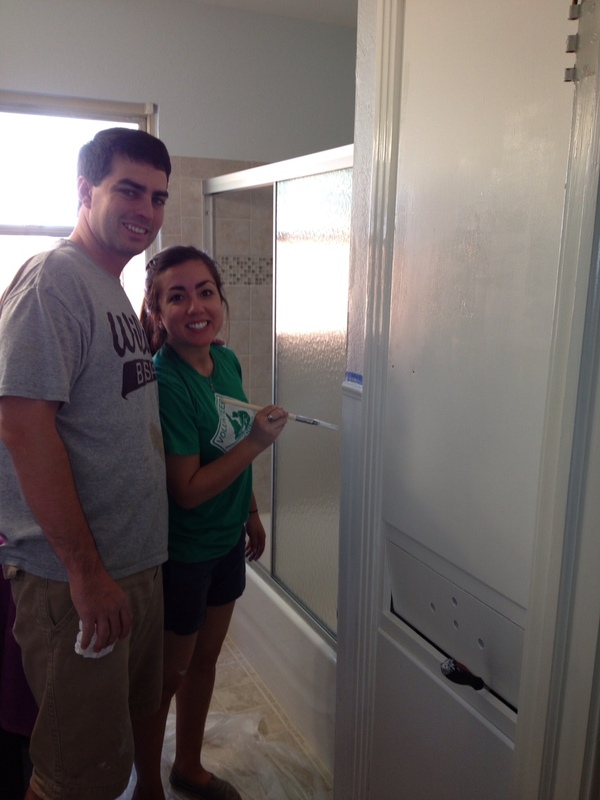 Stay tuned for more on our weekends spent working on this bathroom! 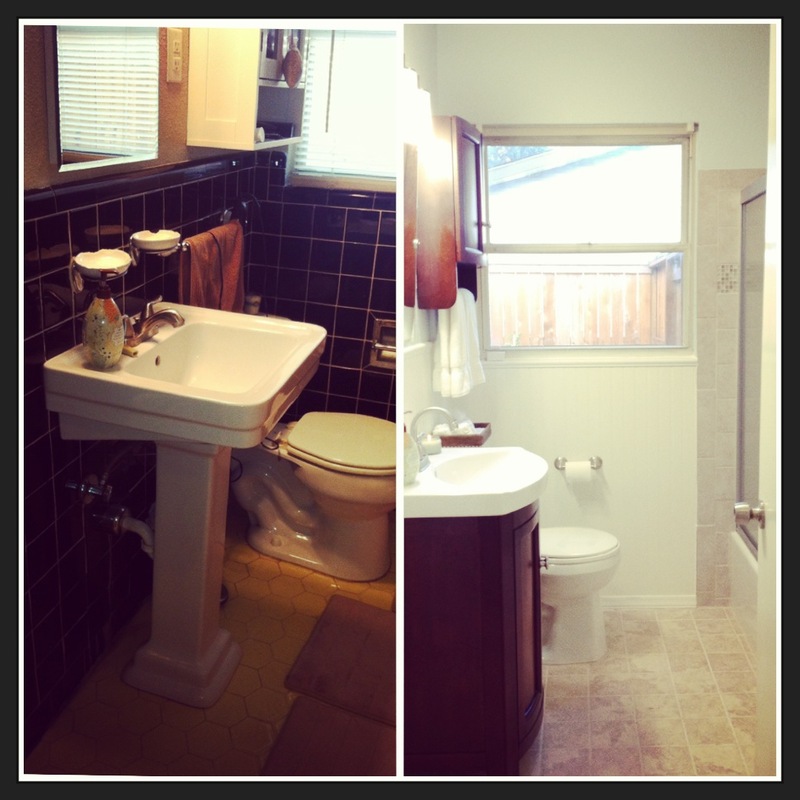 This entry was posted in DIY, House Projects and tagged bathroom, DIY, home improvement on August 3, 2013 by the nance familia.